Adoption Day was October 5th. It was a big day for Andrew. We had done a test run at Grandpop office so he would understand what was happening. I am so glad that we did because Andrew thought that he was going to get a pinch(shot). As a result much stress was removed. 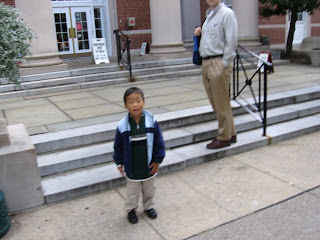 Andrew on the court house steps before the proceedings. 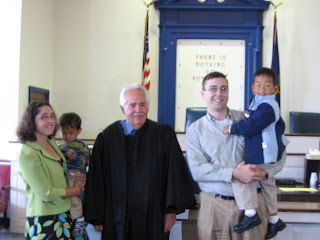 This is the judge that presided over the hearing and he also did Aaron's adoption. The procedure didn't take very long and Andrew did very well. 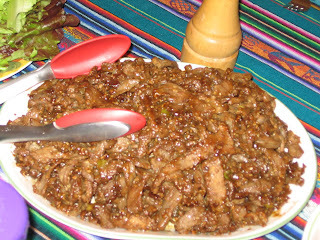 As part of our celebration we had a traditional Korean dish called Bulgogi. Aunt Cindi made it and she got the recipe from her Korean exchange student several year ago. It is amazing. It is served with lettuce and rice. 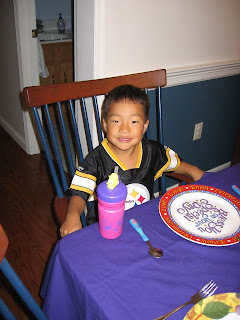 Andrew is not in traditional Korean attire called hanbok which is often worn for special occasions but grandpop did think that he needed special attire for his adoption day. Andrew is wearing it here. Andrew's one request was a red cake with trains or cars on it. This is the result. It was made locally by Cheryl's Bakery and the cake was incredibly moist and tasted great. So all in all it was a very special day. 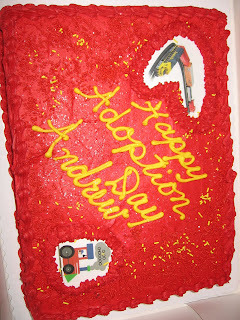 Also Andrew informed me the other day that I should have cake with yellow icing on my adoption day.